Completely reorganized to reflect the growing intricacy of the study of ASL linguistics, the 5th edition presents 26 units in seven parts. Part One: Introduction presents a revision of Defining Language and an entirely new unit, Defining Linguistics. Part Two: Phonology has been completely updated with new terminology and examples. The third part, Morphology, features units on building new signs, deriving nouns from verbs, compounds, fingerspelling, and numeral incorporation. Part Four: Syntax includes units on basic sentence types, lexical categories, word order, time and aspect, verbs, and the function of space. The fifth part, Semantics, offers updates on the meanings of individual signs and sentences. Part Six: Language in Use showcases an entirely new section on Black ASL in the unit on Variation and Historical Change. 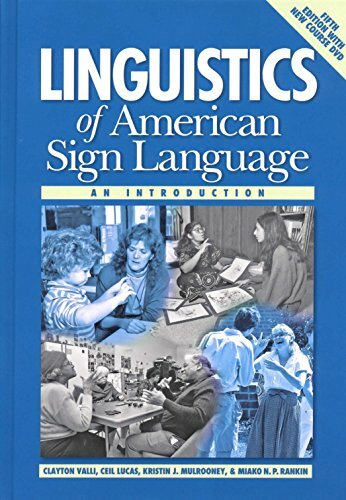 The units on bilingualism and language and ASL discourse have been thoroughly revised and updated, and the Language as Art unit has been enhanced with a new section on ASL in film. Two new readings update Part Seven, and all text illustrations have been replaced by video stills from the expanded DVD. Also, signs described only with written explanations in past editions now have both photographic samples in the text and full demonstrations in the DVD.